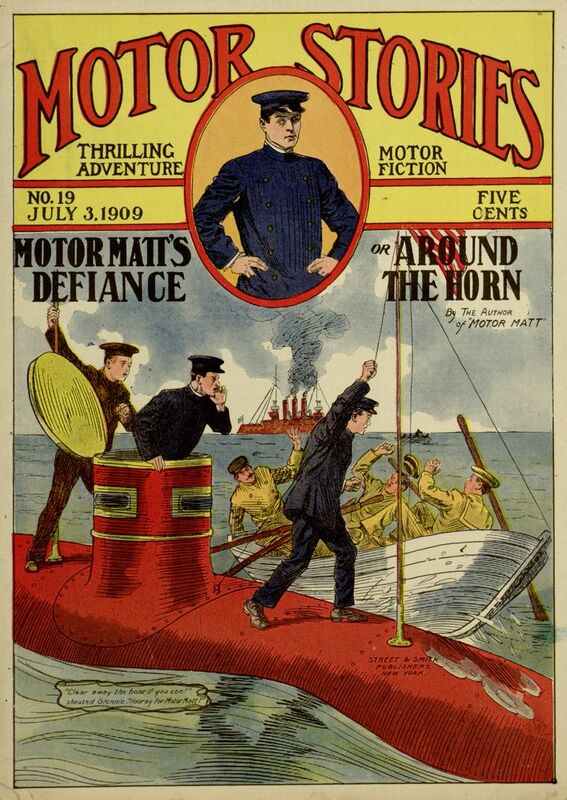 This week sees the release of another Motor Stories issue on Project Gutenberg, thanks to the labor of Distributed Proofreaders and the use of images from our Digital Library. 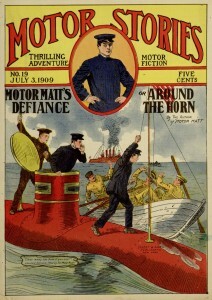 In Motor Matt’s Defiance; or, Around the Horn, the Motor Boys continue their mission to deliver a submarine into the hands of the U. S. government while facing a variety of foes and obstacles. Perhaps more interesting than the lead story here is the inclusion of the first half of “The Spider Water,” an unattributed tale which turns out to be abridged from a portion of Frank H. Spearman’s Held for Orders, a collection of rail-themed short stories. This particular story appears to have been reprinted in a variety of places, and it might be interesting to investigate how it made its way to the pages of Motor Stories, where it seems stylistically a bit out of place. As always, the full issue can be read online at Project Gutenberg.